There are close parallels between the non-dual teachings and some schools of Islamic mysticism, which is often referred to as Sufism. Some of the highest expressions of Sufism are found in Persian poetry. In this mystical-poetic tradition, the writings of Hafiz have a prominent place. In Search of Hafiz contains 109 lyric poems by Hafiz (or Hafez), translated from the original Persian into English. And our home is already in ruins. Beneath the blue dome of the sky. This abode of vexation is not your true home. From the topmost parapets of heaven. For I heard it from a Teacher of the Path. For they come from one of devoted heart. Will not open for you or for me. This aged hag has slept with many a lover. In the treacherous smiles of the rose. Envy not Hāfiz, ye meaner rhymesters! Are a gift from the hand of God. Hafiz lived in Shiraz, in what is now Iran, probably from about 1315 to 1390. Little is known for certain about his life. It seems he sometimes experienced poverty, at other times he apparently enjoyed the patronage of powerful rulers, in whose courts he served as court poet. In his poetry, references to worldly love and wine are inextricably mixed with expressions of divine love. There has been much debate and little agreement about its true meaning. Ambiguity and multiple layers of meaning are particularly characteristic of the Persian poets, among whom Hafiz is one of the most read and celebrated. 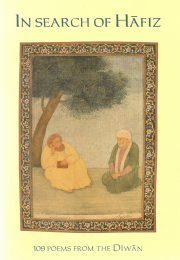 Students of mysticism have read, and meditated upon, poems by Hafiz, finding some of them rising to heights comparable to the writings of Rumi. His ambiguity provides a way for thoughtful, intelligent people to response to religious narrowness and repressive government. Hafiz remains immensely popular in Iran. In Search of Hafiz includes an extensive introduction to put the poems into context and explain unfamiliar references. This book will be of interest to students of mystical literature and Persian poetry. Some who are actively seeking inner illumination, may find valuable insights in these writings, as well as recreation.